In this tab, define the order header and footer memos. These contents can be added to the order form, by pressing the More Options button, at the bottom of the order form, and choosing the "Import Header & footer" option. Country Name Select the country from the list. Friendly Title The name of the Header & Footer, as will be displayed in the list. Attached Contract A4 Pages The number of pages in the attached contract. 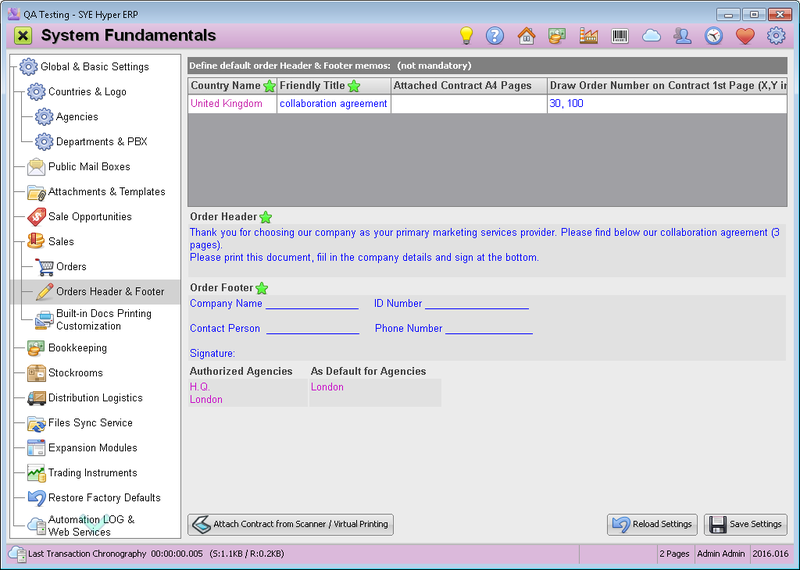 Draw Order Number on contract 1st Page (X.Y in mm) The position of the order number on the contract page. Order Header The content for the "Order Header" field in the Order / Offer Form. Order Footer The content for the "Order Footer" field in the Order / Offer Form. Authorized Agencies Allow the selected agencies to use these Header & Footer. As Default for Agencies Select agencies to define these header and footer as default on their produced orders. Add contracts / documents, to the selected template. Save the modification of the the selected templates.